Today’s post is much more grim than my usual postings and not for the faint of heart. 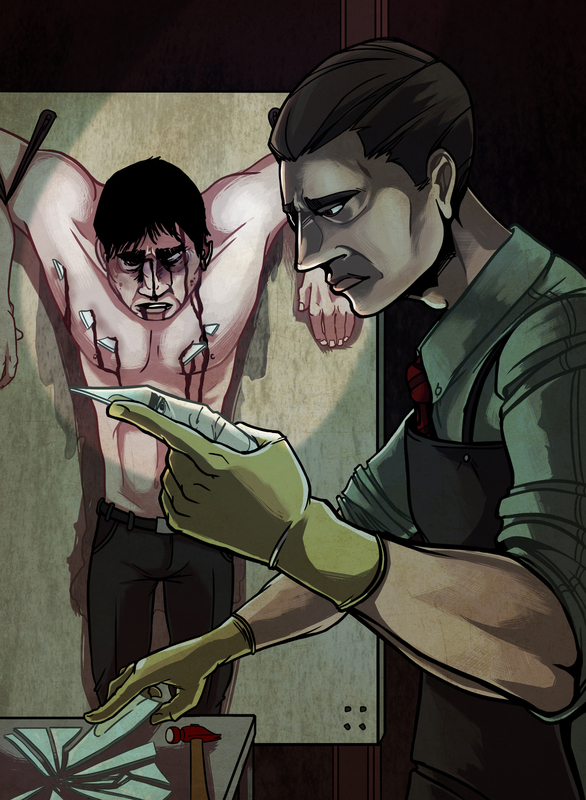 This illustration highlights one of my darker characters named Jean Claude, a man who works as an “Extractor”; a polite way to say he uses interrogation techniques that are not exactly humane. Jean Claude combines physical pain and psychological insight in his methods, digging deep (sometimes literally) to find the answers he’s been hired to retrieve. In this setting, Jean Claude is working over a high-ranking member of a criminal organization, trying to find information on a missing child. The man, as Jean Claude’s research concludes, has had a fear of mirrors/broken glass since he was a child, a fact that is used against the man. Jean Claude’s story is an intense psychological thriller that features espionage, conspiracy and and examination of the value of human life. Sinister is the word that inspired this piece, and it’s certainly fitting.